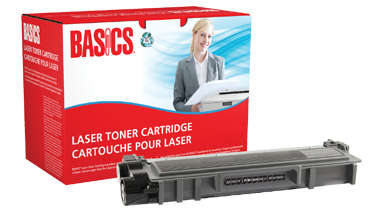 Basics® Brand cartridges are manufactured at ISO 9001:2000 registered facilities using returned, original equipment cartridges. These cartridges are designed, engineered and manufactured to meet OEM performance while ensuring top quality and consistent output. The plastic shell contains an average of 90% post-consumer recycled material. Black. OEM # TN660. Brother DCP-L2520DW, DCP-L2540DW; HL-L2300D, HL-L2305W, HL-L2320D, HL-L2340DW, HL-L2360DW, HL-L2380DW; MFC-L2680W, MFC-L2700DW, MFC-L2705DW, MFC-L2707DW, MFC-L2720DW, MFC-L2740DW. High Yield. Yields 2,600 pages. Contains a minimum of 90% post-consumer recycled material.